Katsu chicken sandwiches, the inspiration for this dish, are a staple of Japanese convenience stores. While I love all manner of fried chicken, from Nashville Hot to Buffalo wings to southern-style, I have a particular fondness for skinny breaded cutlets, cooked golden and crisp. Recently there’s been a marked raise in the profile of such cutlets in menus and media – the surge is a bit of a mystery, as I would argue they’ve always been adored. But, we’re seeing the classic chicken, pork, and veal, and more – beef (specifically Waygu), sardines at Two Lights in London, or cod tongue if you’re Noma’s René Redzepi. As it’s dedicated to Eastern European cooking, Toronto’s Tennessee Tavern is understandably associated with wiener schnitzel (“Viennese cutlet,” made from veal). It is the second-most popular item on the restaurant’s menu after pierogies. After a seasoning including paprika, onion powder and garlic powder, the cutlet is breaded and fried, then served in multiple ways: with kosher salt, lemon and Dijon mustard; with a simple garnish of capers, anchovies, parsley and lemon; or with a Jager (hunter) sauce of cream and mushrooms. The Tavern’s head chef Brett Howson believes that “to have a great schnitzel you need a nice spice blend,” he says. “It is essential that the meat be as thin as possible to ensure its tenderness. A quick fry is best to ensure a crispy breading and to avoid an oily product. Make sure to serve it as soon as it comes out of the fryer!” There is nothing worse than a cold schnitzel, he advises. Similar cutlets were invented in late-19th century Japan during the Meiji period. Katsuretsu, a transliteration of the word “cutlet,” were a version of schnitzel or similar dishes, part of yoshoku, a subset of Japanese cuisine based on Western influences. Shortened to katsu, pork was the standard, and thus became tonkatsu (ton meaning pig). Last summer Saku, a restaurant focused on the preparation, opened in Vancouver and quickly became popular. The menu has six tonkatsu variations from chef Yusuke Matsumoto from Osaka, Japan, utilizing cutlets from both the filet and loin. Katsu sandwiches, or sandos as they’re colloquially referred, are a staple of Japanese convenience stores; pork or chicken cutlets cradled by fluffy slices of milk bread called shokupan, spread with a twangy brown sauce, reminiscent of HP. At Arthurs, the out-of-the-gate institution in Montreal’s Saint-Henri neighbourhood, schnitzel and sando come together for the McArthur, a glorious, challah-stacked marvel of chicken schnitzel met with iceberg slaw. Those cutlets are crusted in the game-changing combination of breadcrumbs and instant mashed potato flakes. Chef and co-owner Alex Cohen dresses the lettuce with a shallot vinaigrette at the last minute to mitigate any sog. Also included in the sandwich, a smear of house-whipped honey and pickled finger hots in the dressing for a balance of sweetness and tang. Cohen maintains that toasting the bread will prepare it to soak up the juices from both the slaw and chicken, capturing all the flavour. The assemblage I’m offering isn’t faithful to one tradition. Instead, it borrows from both schnitzel and tonkatsu heritages, to make my ideal. It has Cohen’s potato flakes in the crust and Howson’s spice, with sambal oelek bringing a thrum of heat to the slaw, and the added speckle of Shichimi Togarashi (Japanese “seven flavour chile pepper” with seaweed, seeds, chili flakes, and citrus peel). The dates in the sauce are inspired by the prune paste that is traditional, as I usually have dates but not prunes in my pantry. If neither are on hand use two tablespoons of applesauce or brown sugar instead, or purchase the sauce ready-made. Coat a grid-style cooling rack with nonstick spray and set over a rimmed sheet pan. Halve the chicken breasts crosswise (with knife horizontal to the board, portioning into two cutlets). If the cutlets are of uneven thickness, bash with a rolling pin or similar to rectify. Pat dry. Pour the cornstarch into a shallow dish with half the Shichimi Togarashi. Season well. In a rimmed dish, stir the tamari into the eggs. In a third dish, stir together the panko and potato flakes, if using, and Shichimi Togarashi. One at a time, dredge each cutlet evenly in the cornstarch mixture, then tapping off. Dip into the egg mixture, letting excess drip back into the dish. Finally coat the cutlets in the panko, turning and pressing the breadcrumbs firmly to adhere. Transfer to the prepared baking rack and pop into the fridge, uncovered. Make the sauce. In a small, microwave-safe bowl, cover the dates and garlic clove with water. Microwave on high for 2 minutes, then let stand for 5. Carefully drain the water, then in a mortar and pestle or a small food processor, crush the dates and garlic until smooth. Stir in the ketchup, tamari, and worcestershire. Set aside until ready to serve. In a deep-sided heavy skillet or Dutch oven, pour in oil to one-inch depth. Set over medium heat and bring to a temperature of 350 F.
While the oil heats, make the slaw. In a medium bowl, stir together 1/2 cup of mayonnaise, sambal oelek and sesame oil. Scatter the shredded cabbage into the bowl, then drizzle the rice wine vinegar on top. Leave to sit for five minutes. Scatter on the green onions and Shichimi Togarashi, then fold cabbage into the dressing. Let the slaw stand at room temperature. Fry the cutlets, working in batches as necessary and turning the cutlets so that they’re evenly golden and cooked through, about 3 minutes per side. Keep an eye on the temperature of the oil; adjust the heat as needed. Drain cutlets on another baking rack set over a rimmed sheet pan, or on a plate lined with paper towels. To assemble the sandwiches, lightly toast the bread. Spoon some tonkatsu sauce on four of the slices. Spread the rest of the toast with the remaining mayonnaise. 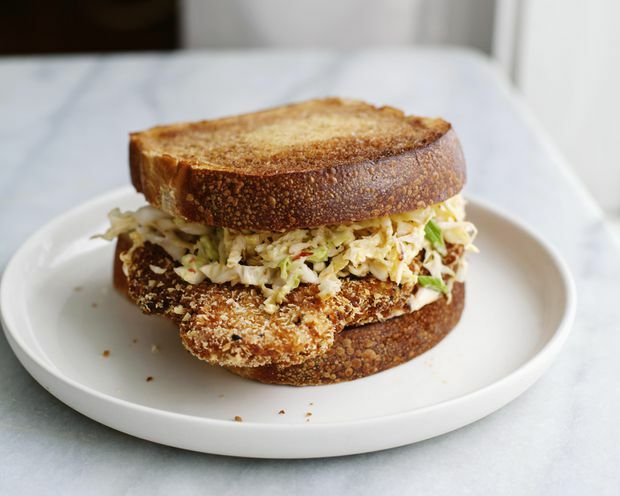 Build sandwich with a cutlet on top of the sauce, then a mound of slaw, and another toast to complete. Eat, with napkins nearby.